The Codelocks CL5250 is a heavy duty electronic full mortice lock with safety feature. Back to back coded locks for code in / code out application. Standard American mortise lock with deadbolt and latchbolt. Allows up to 80 User Codes. Allows up to 10 one-time User Codes to be entered. PVD weather resistant, low maintenance finish. Over 200,000 operations from 4 x AA cells (provided). Tamper alarm and low battery warning. Connections for remote release by reception desk button. Alarm release included. Code Free entry. Lever handle lock for doors hung on the left or right. Use in offices / schools / warehouses / hospitals / care homes / nurseries / hotels / leisure facilities / the home. The key can be used to open doors for management functions such as security and cleaning. The lock can store up to 80 different User Codes. Codes may be 4, 5 or 6 digits long. Programming is via the keypad, using the Master Code. 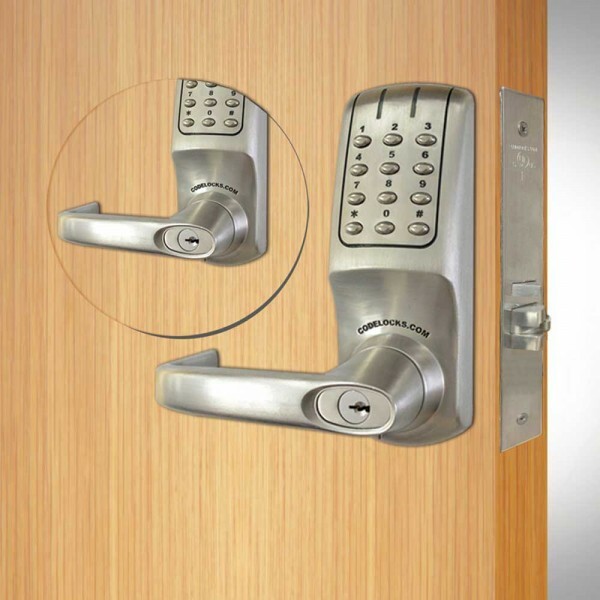 This lock is available to order with Kaba in lever cylinder or alternativley prepared for Small Format Interchangeable Core in which case the cylinder is not supplied. Suitable for high traffic uses.